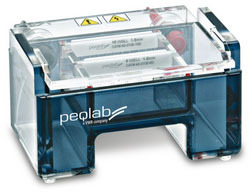 Peqlab Biotechnology GmbH, Germany (A VWR Company) are leaders in manufacturing and supplying of Molecular Biology Products. 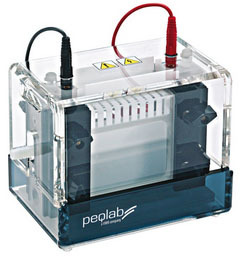 The latest generation of peqSTAR thermocycler family is packed with pioneering cycler engineering and is available in a wide range of block formats (2 x 48, 96, 384 and in situ). 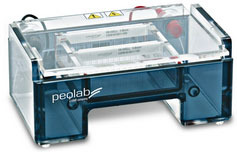 The PerfectBlot Hybridisation Oven provides the perfect conditions for consistent results in hybridisation experiments, including Northern, Southern, Dot or Slot Blots. The rotisserie fits 24 small (150 mm) or 12 large (300 mm) bottles. 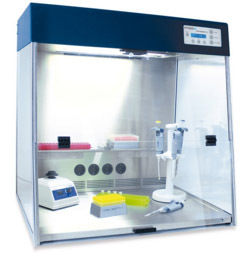 The PCR Workstation Pro provides the ideal environment for biomolecular experiments sensitive to contamination and provides sufficient space and electrical connections to make a really useful and practical working area. 8 mm thick, ethanol resistant safety panels made of Makrolon® effectively protect against UV irradiation. Click on the products listed below to find out more. 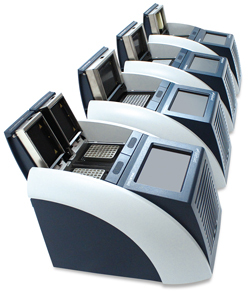 The latest generation of the peqSTAR thermocycler family, packed with pioneering cycler engineering and available in a wide range of block formats (2 x 48, 96, 384 and in situ). The combination of high specification engineering and superior system control enables powerful, fast ramping, stable temperature control and a high level of system reliability. The 'touch screen' control, USB ports, LAN connection and the universal block for 0.2 ml and 0.5 ml tubes result in unique ease of use. The peqSTAR thermocyclers provides both best technical specifications and all so very simple of use, e.g. the FlexGradient™ Technology, emulation mode, 'peqSTAR Manager' PC software, etc. The Primus 25 advanced® offers approved technology and highest precision for your daily laboratory work. 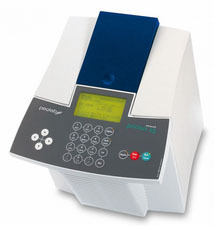 With its small footprint the Primus 25 advanced is a reliable cycler for small sample numbers. The smallest of all the PerfectBlueTM Electrophoresis Systems, the Mini S can be used for up to 24 samples enabling short and rapid sample separation. This highly popular model comes packed with all the features of the larger models, including direct chamber gel casting and embedded platinum electrodes, and comes supplied ready to use with lid, power leads, a choice of 2 combs and a gel tray with a clear to read ruler. System is supplied with 6 and 10 teeth, 1.5 mm combs as standard. Please tell us if you would like another option at time of ordering. 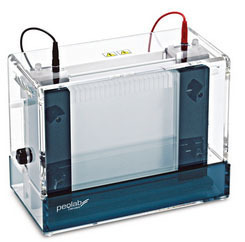 The Mini M electrophoresis system is a very convenient size for a wide range of routine uses. 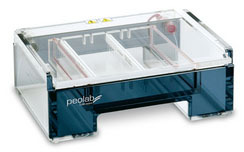 Supplied with 2 combs, but with a wide range of standard and Microtitre combs available, this system can be used for the separation of up to 36 samples. The system comes 'ready to use' with lid, power leads and a gel tray. Through its high specification construction and embedded platinum electrodes it provides very high quality results time after time. The system is supplied with 10 and 14 teeth, 1.5 mm combs as standard. Please tell us if you would like another option at time of ordering. 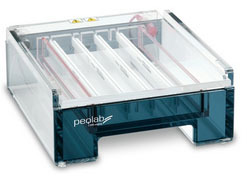 Capable of running 12 x 14 cm gels, the largest of the 'Mini' range still offers the convenience of direct gel casting in the tray, in an easy to manage product size for reliable, high quality electrophoresis. This system can be supplied with a choice of gel trays suitable for 2, 4 or 12 combs and an expansive range of standard and microtitre combs, making this versatile system appropriate for both routine and small separation electrophoresis. As with all PerfectBlueâ"¢ products, this horizontal gel system is backed by a full 3 year warranty! 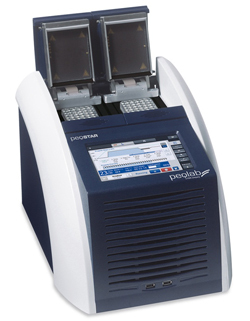 Capable of rapidly running up to 160 samples, the Midi S is a compact though highly efficient electrophoresis system. Versatility is built in from the start, with six different comb positions and a choice of 10 different comb types and thicknesses. For rapid handling, special microtitre combs enable rapid loading with a multi-channel pipette while the effective rubber sealed 'end gates' permit gel pouring right in the tray. With its extra wide design, the Midi ExW is ideal when you need to run lots of samples, up to 200, just a short distance. Ideal for genotyping. This format, along with its compact footprint offers rapid run times without compromising on power. The result, a system for high throughput sample processing generating crisp clear band data. Additionally, gel size can be reduced by using wall combs or the aluminium Casting Dam. As an addition, this system is compatible with our levelling platform. The smallest of the Maxi series, the Maxi S Plus is fully equipped and ready for use. 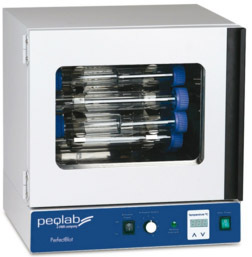 Suitable for high quality sample separation of up to 160 samples per run. With this flexible system, the gel size can be split into two, three or four sections by using different comb positions, plus the gel size can be reduced using the Wall Comb or the Casting Dam system. 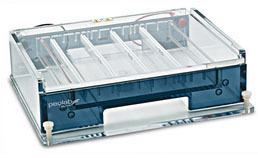 The system comes supplied with your choice of three combs â€" either standard combs or microtitre combs, which are ideal for use with multichannel pipettes. Additional combs are available from the list below. Using the system's 'End Gates', gel pouring is leakÂ­free and easy. And using the system's levelling table, the resulting gel will be flat maximising the quality of your run. Considerably wider than the Maxi S Plus, the Maxi M model can accommodate up to 168 samples but still in an economical footprint. Offering a very wide choice of standard and microtitre combs, the Maxi M is a popular and versatile 'Maxi' system for the busy, high quality, laboratory. But with more than just large sample runs in mind, the Maxi L has been designed for economy and efficiency. The system offers the use of economical partition walls, used to generate smaller gels and for loading the samples, the microtitre combs permit rapid and error free loading with multi-channel pipettes. Gels can be poured directly into the tray through the use of the system's sturdy 'end gates' (no need for messy taping) and the three point levelling tray ensures a uniform thickness of gel to reduce 'smiling' effects which are common in gels of this size. Both the 'end gates' and levelling tray are supplied with the system. This 'extra wide' Maxi tank was developed especially for large sample numbers and rapid separation times. Accommodating up to 10 microtitre combs, the Maxi ExW can be used to separate up to 500 samples and facilitates error free loading with multi-channel pipettes. By optimising the position of the embedded platinum electrode and the use of the three point levelling tray with inbuilt bubble level, the Maxi ExW provides highly reproducible and dependable sample separation, free from 'smiling' effects. The tray has 10 comb positions accomodating two different comb thicknesses. The tray is designed for use with sturdy 'end gates' for in-tray gel pouring and economical 'tray partitions' that enable smaller gels to be poured in the same tray â€" saving you time and money. The smallest of the series, the Twin S is designed for rapid separation of typical 10 x 10 cm 'mini gels'. Supplied ready to use with two 10-tooth, 0.8 mm-thick combs, this system provides rapid and effective sample separation. 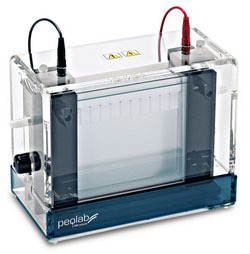 For 16 x 14 cm gels, the Twin M model is a versatile system for SDS PAGE applications in addition to non-denaturing electrophoresis of proteins, SSCPs and dinucleotide repeats. With the enlarged upper buffer chamber, water circulation system and heat-sinking aluminum ceramic plates the Twin M provides high speed separation while maintaining straight and sharp bands. The system actively manages temperature build up with an efficient water cooling system and central aluminum ceramic plates for effective and safe long term operation. The Primus 25 advanced® is a compact personal cycler, with the highest flexibility. Its universal block can be loaded with up to 25 x 0.2 ml tubes or alternatively with up to 13 x 0.5 ml tubes with flat caps. Because of the special design of the heated-lid the height adjusts automatically to the different tube size. In the Primus 25 advanced® highest flexibility is given at programming. For each program step the most suitable command can be selected from a list. Within generously selected areas. 'increment' and 'decrement' of time and temperature are adjustable, enabling even complex applications like the 'touch down' or 'Long Distance' PCR. Cycler with compact design and a universal block for up to 25 x 0.2 ml or 13 x 0.5 ml tubes with flat cap. The PCR Workstation Pro provides sufficient space and electrical connections to make a really useful and practical working area. 8 mm thick, ethanol resistant safety panels made of Makrolon® effectively protect against UV irradiation.